Spherical Air Bearings for Alignment, Zero-Gravity Research | PI Nelson Air Corp.
PI Nelson Air has supplied a number of spherical air bearings for both research and industrial use. These bearings provide excellent load capacity and stiffness while allowing three axes of inherently frictionless rotational motion. Commonly used for zero-g satellite research, they have also been used in systems for precision chip bonding and optical alignment. 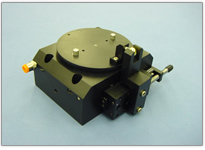 Extremely rigid spindles can be made using a spherical bearing at each end of the spindle shaft. This arrangement also allows precision alignment of the spindle shaft on the fly by moving one spherical bearing relative to the other. 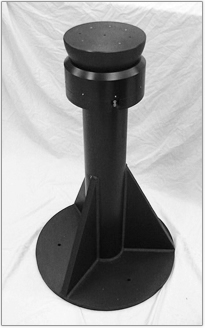 We can also provide custom pedestals and air handling equipment to mount our spherical bearings for your application. Small diameter spherical air bearing with hollow center to reduce inertia. 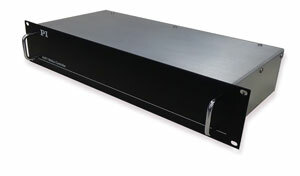 Used for small satellite testing. 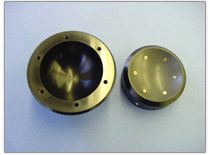 Spherical Air Bearing assembly for planarization and assembly of critical optical components. Vacuum locking option allows sphere to be locked in any orientation and precision theta adjuster allows controlled rotation of sphere for alignment with other components. 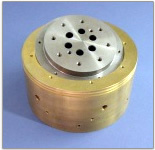 Spherical air bearing with mounting pedestal for satellite testing.